Download PicPick latest version 4.2.6 free. 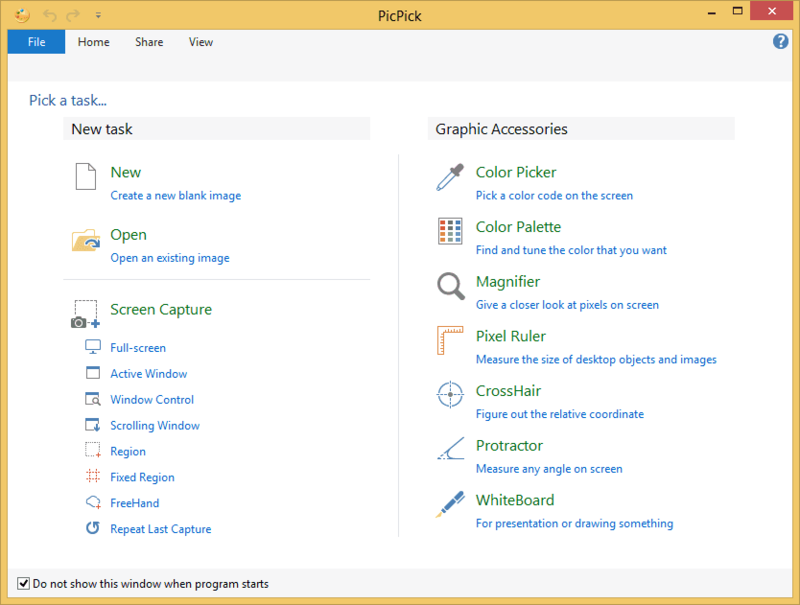 PicPick is an image editor application that is user friendly and full of features. It helps you to create your image that is exactly suitable for software developers, home users and graphic designers. It is a full-featured screen capture tool, Intuitive image editor, color picker, color palette, pixel-ruler, protractor, crosshair, whiteboard and more. Take screenshots of an entire screen, an active window, the scrolling windows and any specific region of your desktop, etc. Annotate and highlight your images: text, arrows, shapes and more with the built-in image editor that includes the latest Ribbon style menu. Using PicPick, save, share, or send your images via Web, email, ftp, Dropbox, Google Drive, SkyDrive, Box, Evernote, Facebook, Twitter and more. With highly advanced settings, you can customize hotkeys, file naming, image quality, and many other options that fits your needs. Variety of graphic design accessories including color picker, color palette, pixel ruler, protractor, crosshair, magnifier, whiteboard. With the built-in image editor that includes the latest Ribbon style menu, you can annotate and highlight your images. Help you find the exact pixel color code on your screen with a built-in magnifier window. Support RGB, HTML, C++, Delphi. With light, smooth and sizable magnifier tool, you can see any desktop area magnified in its magnification glass.